Talk about Samsung's upcoming Tab S4 tablet have been popping for a while now, hinting at a possible release soon, and what's a better fit for that than the upcoming IFA trade show in Berlin, Germany. It better come sooner rather than later since it will quite possibly be the only adequate answer to Apple's dominance on the tablet market. When it comes to the hardware specs of the Tab S4, we already expected top-of-the-line internals but missed the finer details that would make the picture that much clearer. It just so happened that SamMobile got hold of a seemingly complete specs sheet for the upcoming slate, revealing pretty much everything that there's to know about the device. And here's the gist of it! The Tab S4 will likely be powered by the Snapdragon 835 chipset and will feature 4GB of LPDDR4X RAM as well as 64GB of storage inside of it. Up front, a 16:10 Super AMOLED display with a resolution of 2,560 by 1,600 pixels will have the task of wow-ing your senses. While cameras are not that much of a selling factor on tablets, Samsung will be throwing a 13MP camera at the rear and an 8MP selfie one at the front. There will most certainly be an iris scanner right near the selfie camera as Samsung isn't expected to adorn the tablet with your regular fingerprint scanner. Possibly the most important aspect of the tablet will be its superb battery, which will likely stand at 7,300mAh. This will be the largest battery ever fitted in a Samsung Tab S tablet, with the preceding Tab S3 holding a 6,000mAh unit and the even older Tab S2 9.7-inch boasting a 5,870mAh battery. Needless to say, this will likely help the slate last quite along time. 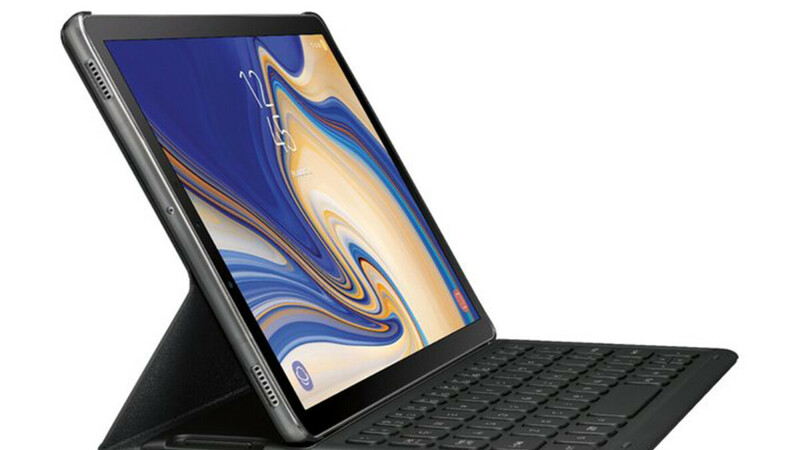 Additionally, the Galaxy Tab S4 will seemingly feature AKG-tuned audio as well as support Samsung's in-house DeX extensive desktop functionality, which is pretty nice. Finally, the slate will have standard stuff like USB Type-C port, Bluetooth 5.0, GPS, Wi-Fi 802.11 ac, and so on. The Tab S4 will be powered by Android 8.1 Oreo, which is great news and should future-proof it to a certain extent. As we said, keep your hopes posted for a potential IFA 2018 unveiling of the tablet. I think Samsung has improved a new battery technology. The note 9 has a smaller or similar footprint to the note 8 yet it fits a much larger battery. The Tab s4 has a slightly larger footprint than its predecessor yet the battery on it is much larger. They just improved the old battery technology, and they keep doing that every year. But you won't see their battery dept. bragging about it. No they did not, the Samsung flagships battery capacities have gone down since the S7/Edge while the phone internal volumes has gone (way !) up. They don't have anything to brag about, if anything, they should be ashamed of themselves for stagnating so many years. Poor battery life is one of the reasons the S9/S9+ did not sell well. Well Samsung's speciality has always been hardware and cramming all those specs and features into a small body is nothing new. I'm glad they stopped being so frugal with the battery sizes and finally moving on from the note 7 drama. This makes me excited for every piece of new portable tech from them, meaning tablets, laptops and smartphones, as it seems like you can expect battery capacities that are far greater than before, which is amazing. This just makes it seem like the 4000 mAh battery for the Note 9 might actually be true, even though it sounds insane, when they also have to fit an upgraded s-pen in there as well. To be honest I would buy Samsung S4 over Huawei M5 10 in a heartbeat. Wacom stylus is much better, screen is amoled, it should have a headphone jack, decent speakers - BTW Samsung owns AKG, DeX is much more fleshed out (not necessary better by a huge margin in everyday use). I will probably buy 2 Huawei M5 8" for my kids, but for myself? I want something ... mature. That might not mean Samsung S4, but it certainly does not mean Huawei M5 10". M5 10" is not good enough, not for me because I don't really care if Kirin is 10% faster. The original Tab S had a bigger battery and it was still incredibly light... but back then Samsung didn't worry about "premium" build or any other nonsense tech blogs like so much so they could still use materials that make sense. Well samsung nexus 10 Tab was having 9000 mAh.